After a long week of dressing conservatively at work, I always look forward to wearing relaxed clothing on the weekend. 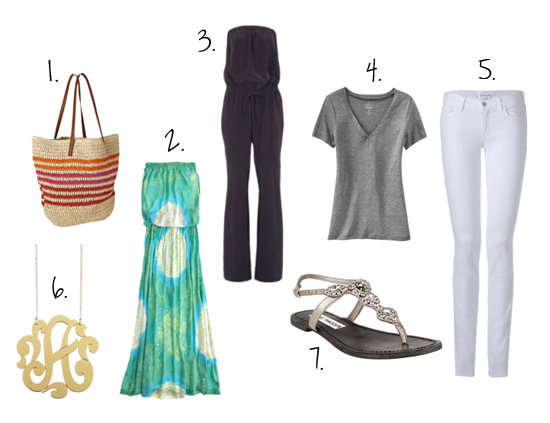 The items below are just a few of my favorites that I'd love to wear everyday for the rest of spring and summer. The weather is supposed to be gorgeous here this weekend and I know that my white skinny jeans will be getting their fair share of use. What's your go-to weekend outfit? Have a great weekend everyone! how to stay casual and chic at the same time. Love nº 2 cute dress. Such a lovely summer look- LOVE the silk jumpsuit! I want a monogram necklace so badly! I have been wearing my white jeans like crazy too but soon it's going to be too hot for them and I'll have to switch to my white shorts. Have a great weekend, Audrey! I super love the maxidress & the jumpsuit....perfect for summer getaways! these all look so comfy and perfect for a breezy summer weekend of relaxing! i need to invest in a cute jumpsuit, looks so fetching! I would rock each and everyone of those on a summer weekend.... love maxis on a weekend. Oh I like that jumpsuit...I pretty much wear flowy tees and shorts every day on the weekend. It's all about being casual! love love love! I might have to buck up and try out that amazing silk jumpsuit! Love the white denim with gray tee combo! Perfect! I could easily lounge in any of those pieces. I need to get some white pants and I really love those Steve Madden sandals as well. Ooh, that maxi is gorgeous. I love the ease and sophistication of a breezy dress! Hope you enjoy the weekend! in love with the maxi skirt! perfect for the hot summer months! I love every piece!All amazing!The sandals is my favourite! great and i could assume you're an expert on this subject. Well with your permission allow me to grab your RSS feed to keep updated with forthcoming post. Thanks a million and please keep up the gratifying work.